Technology should make our lives simpler, not more complicated; with so many changes and so many new devices, it's hard to keep up. But stress less because we've done the hard work for you! Lumsing combines the latest technological innovations with affordable and stylish electronic accessories to maximize convenience and keep you connected without problems. Make life simple again: Simply Connected! 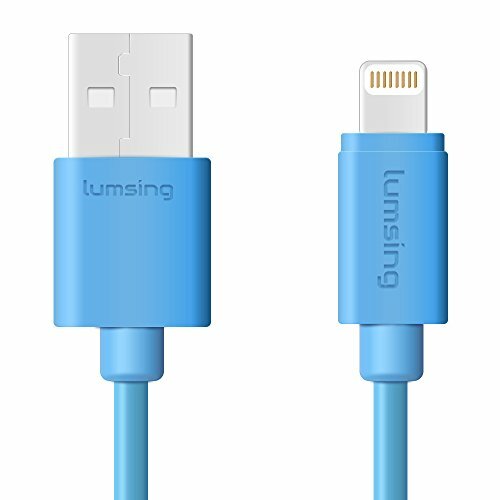 The Lumsing sync charging cable Apple MFi Certified, works perfectly with all Apple devices with lightning connection. This lightning cable contains a unique, verified serial number and an authorization chip issued by Apple, ensures 100% compatibility with any lightning device. iPhone 6S, 6, 6 Plus, 5S, 5C, 5, iPad Air, Air 2, iPad with Retina display, iPad Mini, Mini 2, Mini 3, iPad 4th generation, iPod touch 5th generation, iPod nano (7th generation). FAST-CHARGING CABLE: The Lumsing MFi cable connects your Apple devices with lightning connector, providing the fastest possible charge via your iMac or computer's USB port as well as the USB hub on a wall outlet. APPLE MFI CERTIFIED: Complete charge and sync compatibility with iPhone 6S, 6 and 6 Plus, 5S, 5C, 5, iPad Air/Air 2, iPad Mini/Mini 2/Mini 3, iPad 4th generation, iPod touch 5th generation, iPod nano (7th generation). DURABLE CABLE WITH LONG LENGTH: Using unique Strengthening Technique to make the cable strong enough (4000+ bend lifespan) to withstand repeated unplugging and storage. A lot more durable than ordinary cable. It is 3.3 ft long, convenient to be used at home, in the car, in the office and anywhere else. PERFECT FIT YOUR CASE: The narrow design of the lightning adapter provides compatibility for most iPhone and iPad cases. WARRANTY: 18-month warranty. Friendly, fast and effective customer service. If you have any questions about this product by Lumsing, contact us by completing and submitting the form below. If you are looking for a specif part number, please include it with your message.